If you're stumped for a super-keen title for your upcoming videogame, fear not! 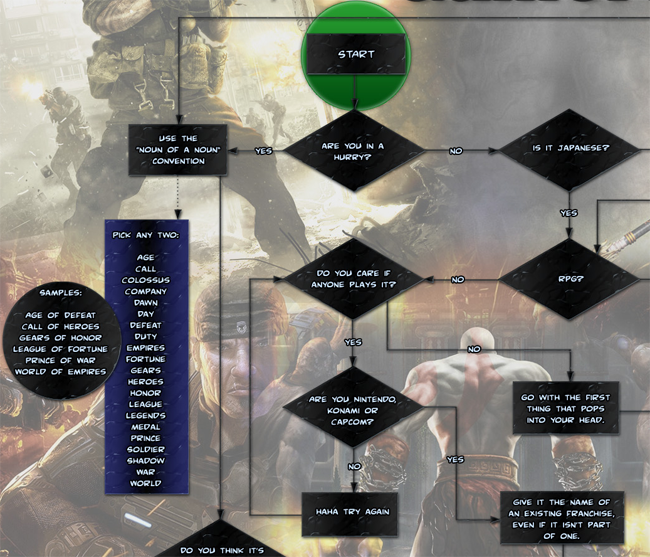 This flowchart has all your videogame-naming needs soundly covered. Naming a videogame can be tricky business. On the one hand, you don't want a bland and boring name like "Legend of a Hero," but on the other you don't want a super-complex name that gamers will mock on a regular basis. So what's a studio to do? GameFront has put together a handy flowchart for aspiring game-namers that runs the gamut from Western sci-fi shooters to Japanese RPGs that nobody over here will ever play. It's marvelously well put-together and bitingly hilarious in that way that makes you shake your head and sigh at how true it is. If you're in a rush, just slap two manly-sounding words together and put "of" between them: Heroes of Men, Prince of Empires. On the other hand, if you're making a sci-fi action game, best to go with a simple one-word name "that could pass as a metal band," like Centigrade, Circuit, or Prime. If you're a Japanese company that isn't Nintendo, Konami or Capcom, you can pretty much just do whatever you like with some gratuitous European languages thrown into the mix. I'd play some of these games, I admit. Anyway, check out the whole thing over at GameFront; whoever put it together did a great job. For the record, "Torchlight" is probably my favorite game name from the past few years: It's simple, evocative, and memorable.